Dallas based RadioTime said today that it has released a BlackBerry version of its popular Internet radio mobile application, TuneIn radio. Features of the Blackbery app include the company’s new Song Search technology, which allows users to search for radio stations airing a specific song or artist in real time. RadioTime, which also produces popular iOS and Android Internet radio apps, says the new Blackberry app can search for programs airing on over 50,000 radio stations, music streams and podcasts from around the world. 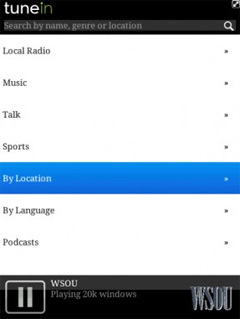 The app uses a BlackBerry device’s built-in GPS or WiFi to automatically detect and display what programs are airing on local AM/FM stations. The ad-supported TuneIn Radio application is available for download on your BlackBerry browser at http://radiotime.com/bb. It’s compatible with all BlackBerry smart phones running OS 4.5 or later and is available to users worldwide.